designed to withstand r ough treatment. tongue. Double-stitched backstay. Steel shank. Black color. Shoe made in U.S.A.
Men's. "D" medium width only. 7D, 8D, 9D, lOD, HD. is full size. order usual size. is half size, order next full size larger. cushioned tongue . Double-stitched backstay. In "D" medium width only. 6D, 7D, 8D, 9D, lOD, llD, 12D, 13D. 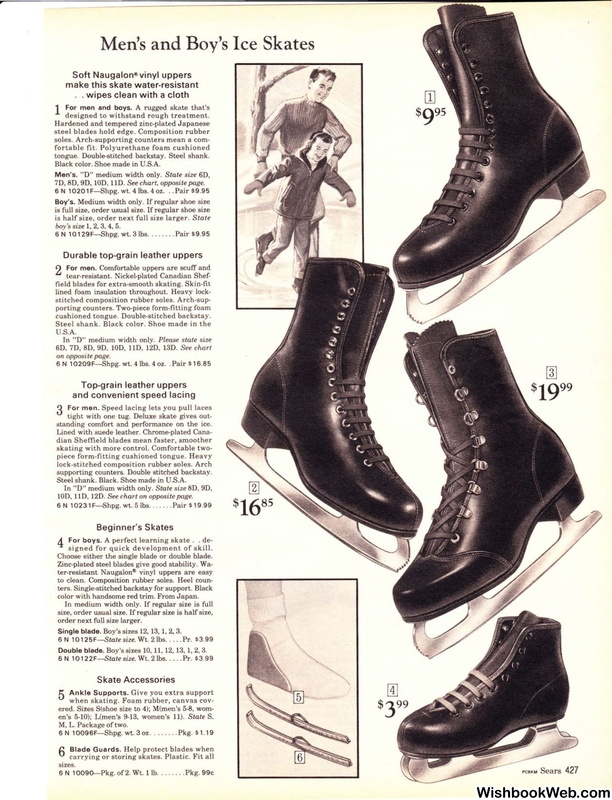 standing comfort and performance on the ice. supporting counters. Double stitched backstay. Steel shank. Black. Shoe made in U.S.A.
See chart on opposite page. signed for qu ick development of skill. Choose either the single blade or double blade. color with handsome red trim. From Japan. order next full size larger. Single blade. Boy's sizes 12, 13, l , 2, 3. Double blade. Boy's sizes 10, 11, 12, 13, 1, 2, 3.
en's 5-10); L(men's 9-13. women's 11).